Not too long ago, I received two games from Out Of The Box for review. I love games because they foster creativity and teach. One thing that they teach that I think is especially important is how to win or lose gracefully. 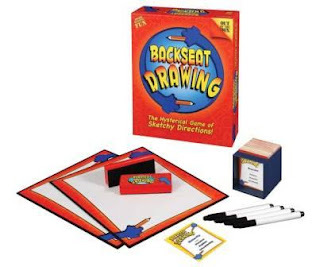 The two games we received were Word on the Street and Backseat Drawing. My children and I have enjoyed these two games for our game night, and I even took Word on the Street to my friend's house on Thanksgiving. You should have seen that! It was so fun! I'm sure we'll have many more fun nights playing both of these games! On each turn, one team flips over a category card. Team members frantically brainstorm words that fit the category while the opposition tries to sidetrack them. The team must agree on a word and pull each letter of that word one lane closer to their side of the street, all before the time runs out. Word on the Street™ will have you in the fast lane to fun! One of you will win one of the above games of your choice! Fine print: This giveaway will end at midnight on 12/15/09 and is open to US Residents only. Winner will be announced here and will be emailed. Winner will have 48 hours to respond to my email or they will forfeit their prize. I'd like the Chain Game. Mu Twitter name is sohamolina. I think that the game Letter Roll looks like fun! Both of the games you reviewed sound great!!! Letterflip - looks similar to Guess Who, but with words! I would like the Letter Roll game. I entered the Eden Fanatasies GC giveaway. The party pooper game looks like fun. I think the Chain Game looks fun. i like word games. I like the game easy come easy go. The Chain Game sound like fun! I would love the WHAD'YA Know? Game!We would have fun because its random questions and everyone getting getting involved! Another game I would love to try with my girls is Pirate versus Pirate. Thank you for the chance to win! I entered the Golden Moon Tea Giveaway. always play various board games and such! 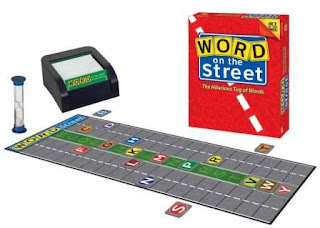 One of their games we would really enjoy is Word on the Street! Also, I follow you via Twitter! I am also entered in your Hallmark Contest. We love the "10 Days in" series from OTB. We have 10 days in Africa, and the kids are getting 10 days in Asia for Christmas.